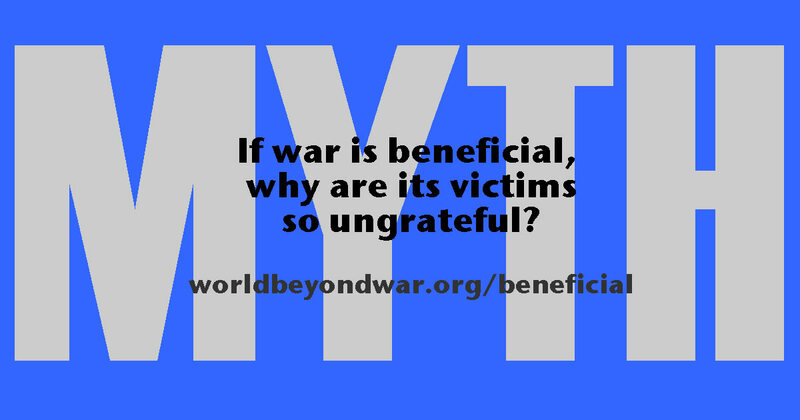 Myth: War Is Beneficial - World Beyond War . . . 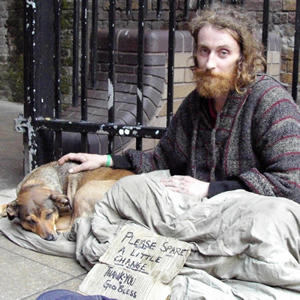 Fact: The profits gained by a few weapons manufacturers and the temporary power gained by politicians who promote wars are so miniscule compared to the suffering of both victims and victors, and the damage to the environment, economy, and society, that almost any alternative to war is more beneficial. To believe that the people who live where your nation’s government has waged a war are better off for it, despite those people’s contention that they are worse off, suggests an extreme sort of arrogance — an arrogance that in many cases has explicitly relied on bigotry of one variety or another: racism, religion, language, culture, or general xenophobia. A poll of people in the United States or any nation involved in occupying Iraq would almost certainly have found opposition to the idea of their own nation being occupied by foreign powers, no matter how benevolent the intentions. This being the case, the idea of humanitarian war is a violation of the most fundamental rule of ethics, the golden rule that requires giving others the same respect you desire. And this is true whether the humanitarian justification of a war is an afterthought once other justifications have collapsed or humanitarianism was the original and primary justification. The wars leave lasting damage in the form of brewing hatred and violence, and in the form of a poisoned natural environment. Belief in the humanitarian possibilities for war can be shaken by looking closely at the short- and long-term results of any war. War tends to leave behind danger, not security — in contrast to the more successful record of nonviolent movements for fundamental change. War and preparations for war removed the entire population of Diego Garcia; of Thule, Greenland; of much of Vieques, Puerto Rico; and of various Pacific Islands with Pagan Island next on the endangered list. Also threatened is the village on Jeju Island, South Korea, where the U.S. Navy has built a new base. Those who have lived down-wind or down-stream from weapons testing have often been little better off than those who have been targeted by weapons use. 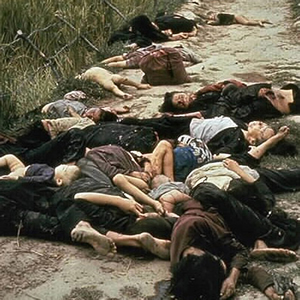 War can be imagined as a tool for enforcing the rule of law, including laws against war, only by ignoring the hypocrisy and the historical record of failure. 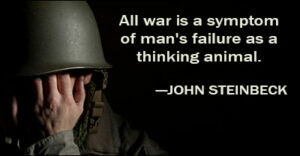 War actually violates the most basic principles of law and encourages their further violation. The sovereignty of states and the requirement that diplomacy be conducted without violence fall before the hammer of war. The Kellogg-Briand Pact, the U.N. Charter, and domestic laws on murder and on the decision to go to war are violated when wars are launched and escalated and continued. Violating those laws in order to “enforce” (without actually prosecuting) a law banning a particular type of weapon, for example, does not make nations or groups more likely to be law abiding. This is part of why war is such a failure at the task of providing security. 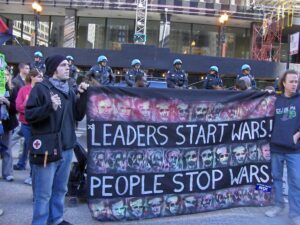 Organizing a group of nations, such as NATO, to jointly fight a war does not make the war one iota more legal or beneficial; it simply employs a criminal gang. 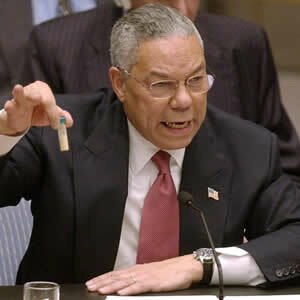 The U.S.A. cannot afford any more warfare. America definitely needs to change our economy away from the Military-Industrial Complex on which it is now based and into peaceful and socially uplifting programs and institutions that promote a better future for our children and our planet. WHEN THE POWER OF LOVE OVERCOMES THE THE LOVE OF POWER / THE WORLD WILL KNOW PEACE. Thank you for ALL of this! I’m in total agreement. I have to back up “jogn”, WWII showed us how war can induce urgency and collaboration in individuals and entire nations, that just would not occur without the presence of conflict. Take as an example the atomic bomb. This was an astounding advancement of technology in such a short time and it was accomplished through Anglo-American (and Canadian) cooperation. This website is great, these arguments are just what the American people need. I think this quote speaks volumes as well. “Nobody wants war,” is a saying people still believe but this quote below I think buries that statement. It’s also interesting the way the Nazis used patriotism.